Optical access (direct insertion method with endoscopic view: optical view method) was reported to be one of the simplified methods for well–experienced endoscopic surgeons on first trocar insertion in laparoscopic surgery. Meanwhile, trocar-related injuries sometimes induce serious outcomes on laparoscopic surgery. 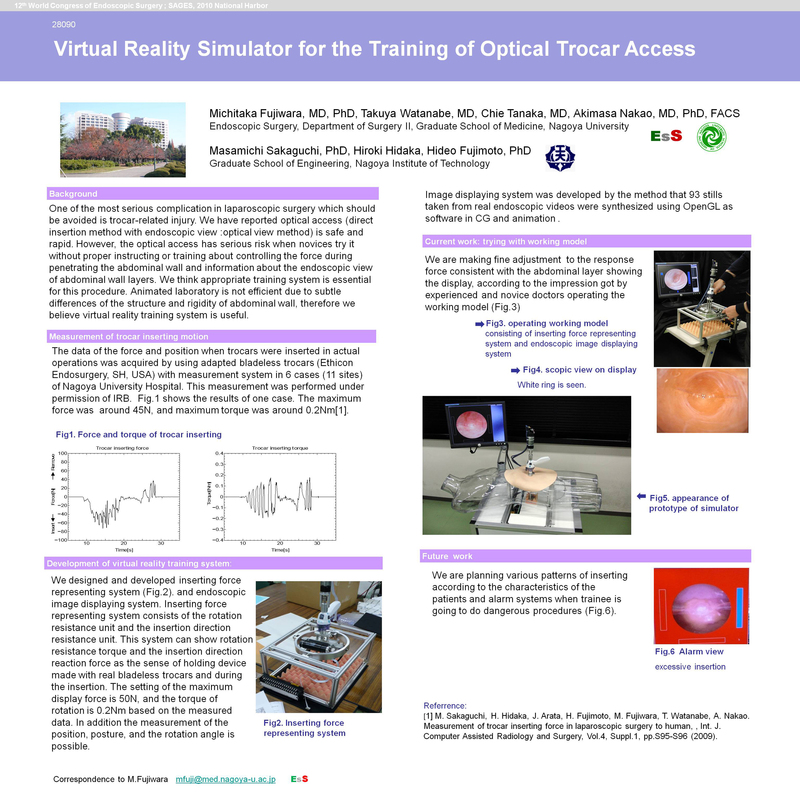 Because abdominal wall resistance and rigidity is different from one in case of animal laboratory, appropriate training system using virtual reality system is necessary for endoscopic surgical residency. We designed and developed inserting force representing system and endoscopic image displaying system. Inserting force representing system consists of the rotation resistance unit and the insertion direction resistance unit. This system indicates rotation resistance torque and insertion direction reaction force as the sense of holding device made with real bladeless trocars. In addition, the evaluation of the position, posture, and the rotation angle is possible on insertion. Image displaying system was developed by synthesis with 93 stills taken from real endoscopic videos using OpenGL as software in CG and animation. Force and position data when adapted bladeless trocars (Ethicon Endosurgery, SH, USA) were inserted in actual operations were measured under approve of IRB in Nagoya University Hospital. We are now analyzing various patterns of inserting according to the characteristics of the patients and developing alarm systems when trainee is going to do dangerous procedures. We will report a new educational system of optical accsess on first trocar insertion.